Kimono Salon aims to instruct readers about the “practical and fashionable use” of kimono. 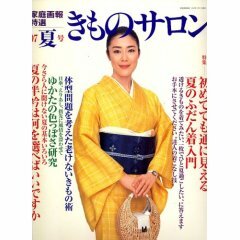 Kimono Salon has a circulation of 50,000 and is published by Sekai Bunka Publishing which also publishes Kateigaho, Kateigaho International, MISS, GRACE, MEN’S EX, Begin, GRACEFUL Wedding and other magazines. Hatsumi Toshima designs hairstyle specifically for kimono fashion.